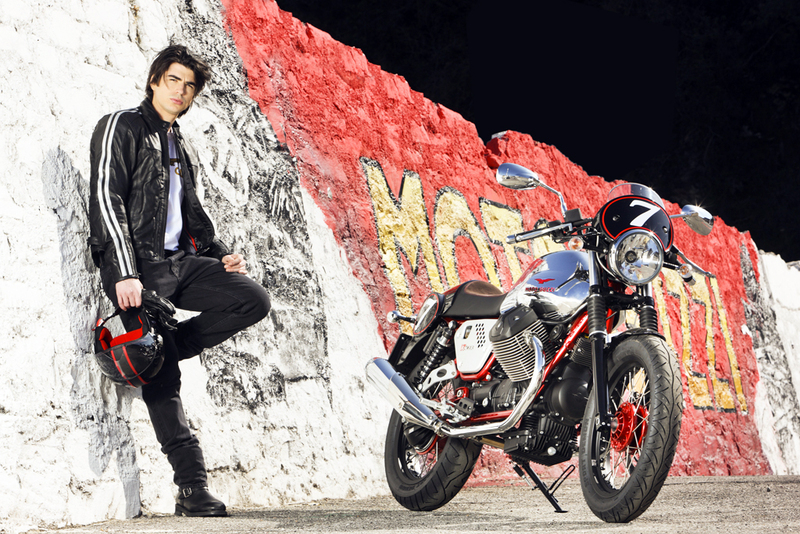 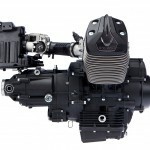 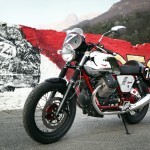 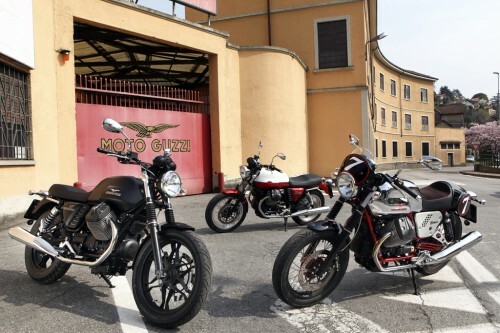 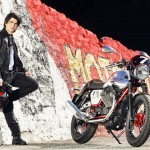 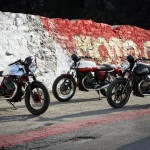 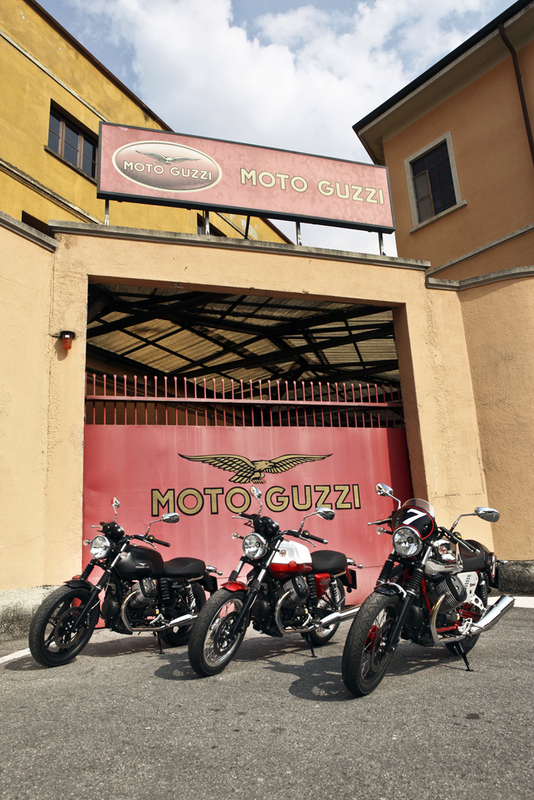 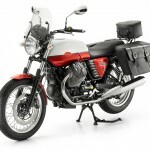 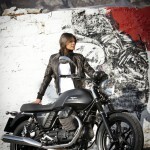 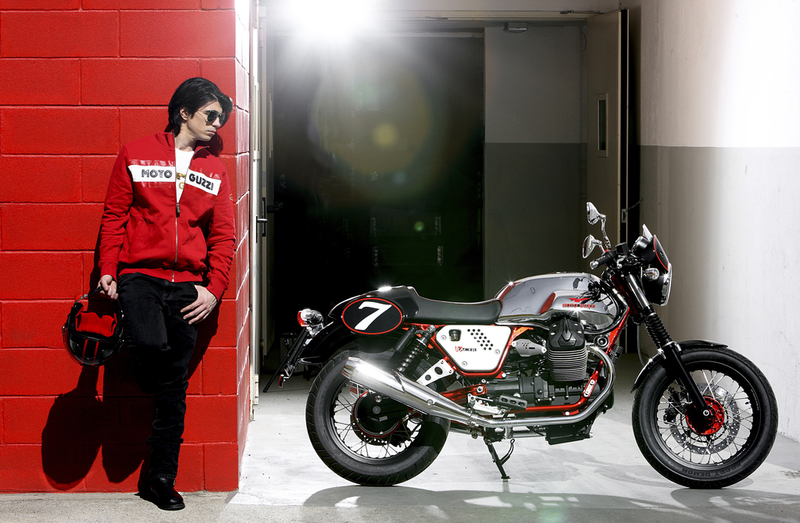 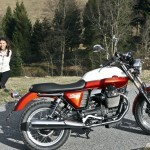 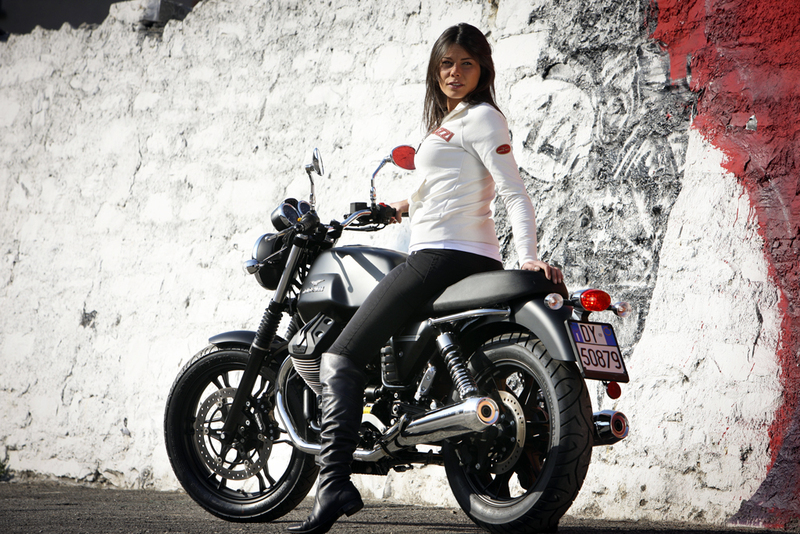 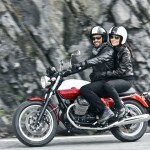 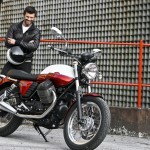 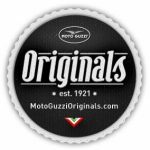 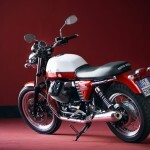 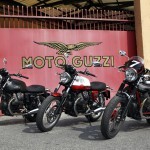 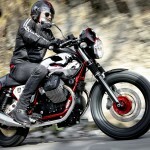 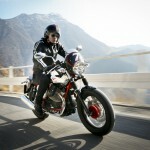 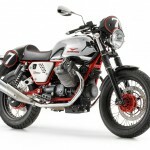 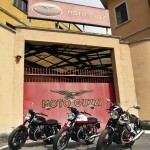 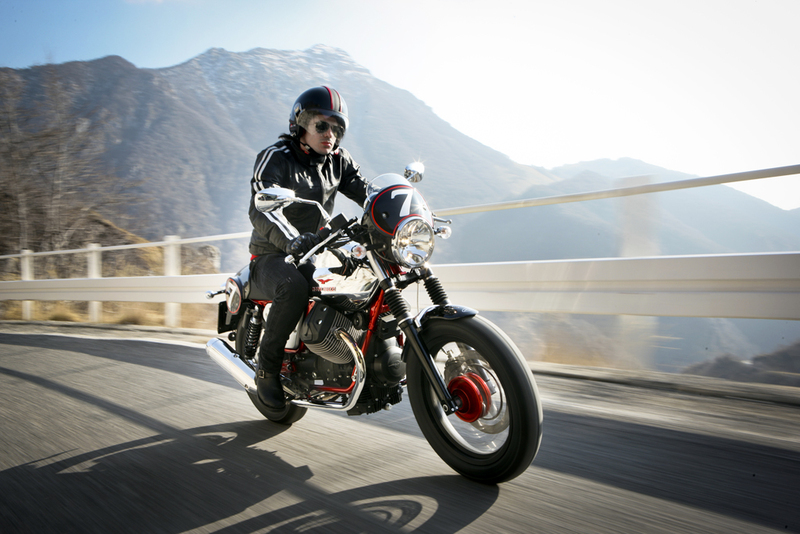 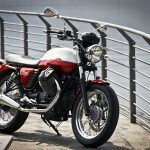 Moto Guzzi presented its 2012 V7 featuring three models and the Piaggio-owned brand’s new 750cc V-Twin engine. 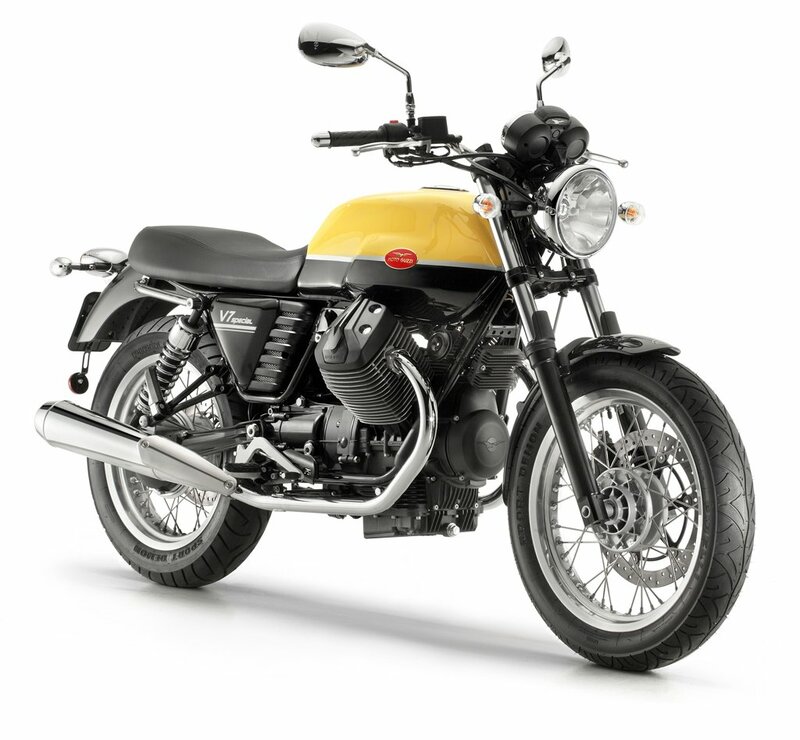 The three models were previously introduced at the 2011 EICMA show as the V7, two-toned V7 Special and the shiny V7 Racer. 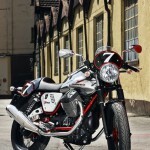 Moto Guzzi has since given the matte V7 version a new name: the V7 Stone. 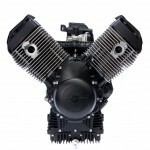 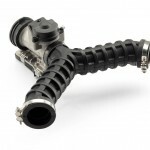 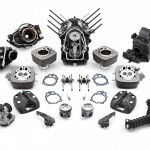 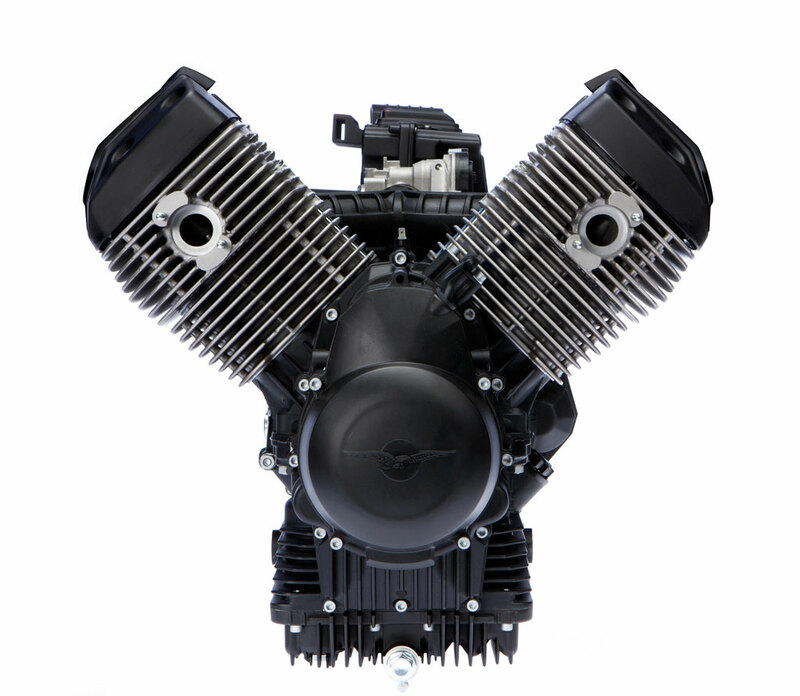 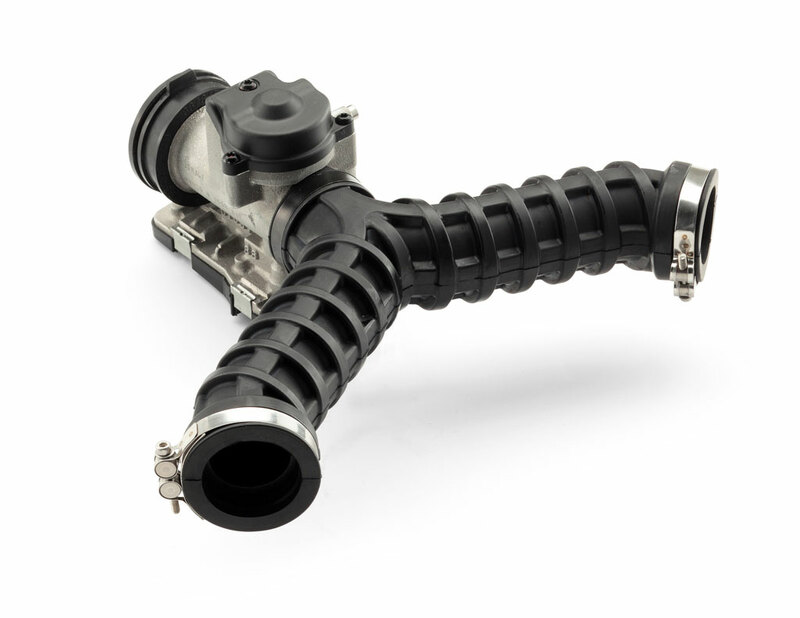 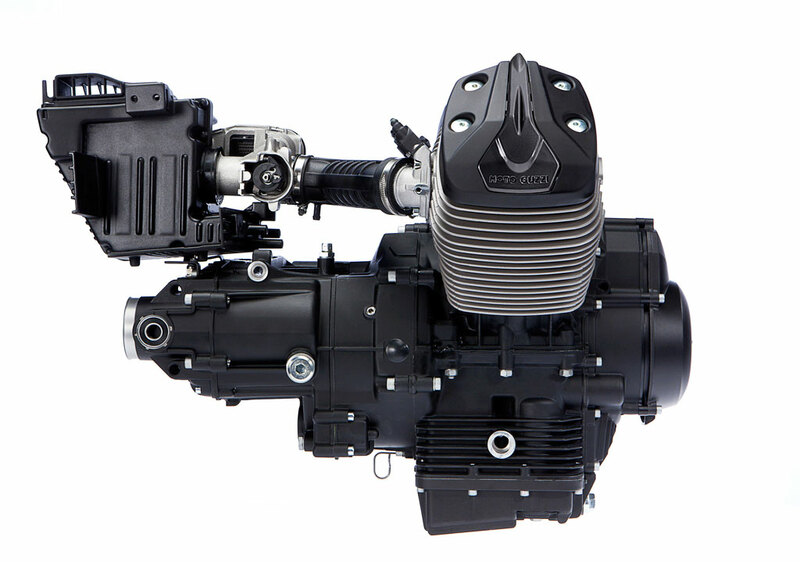 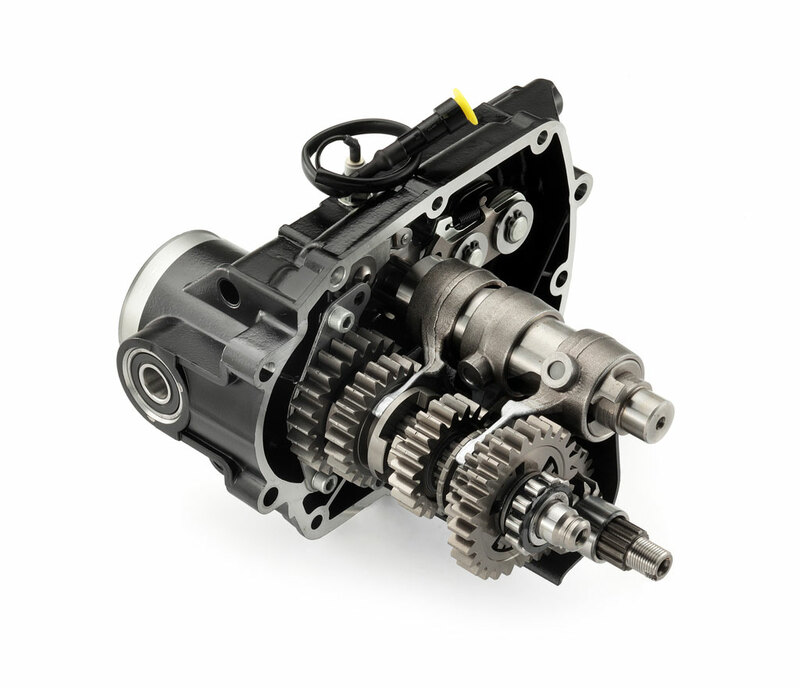 All three models use the same 750cc “small block” longitudinally-mounted V-Twin engine. 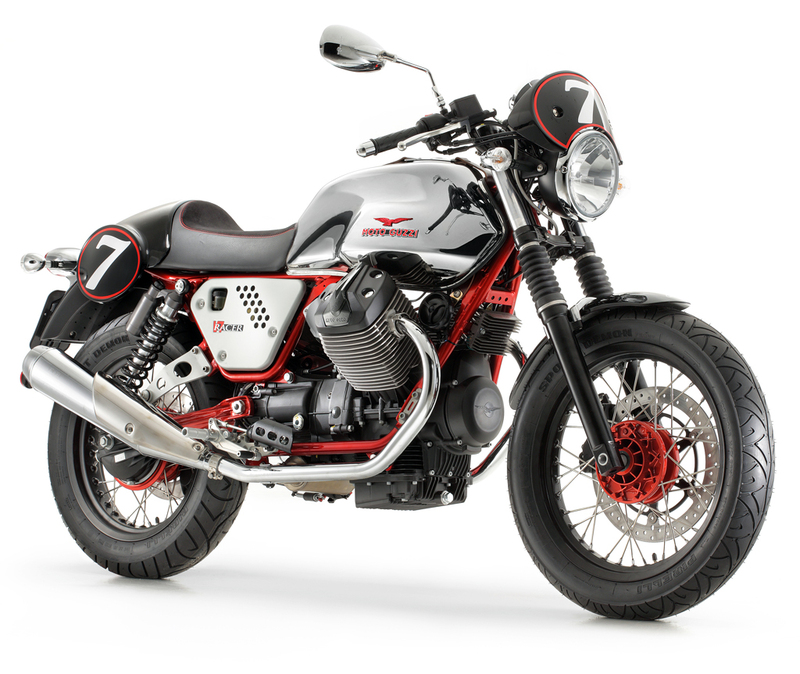 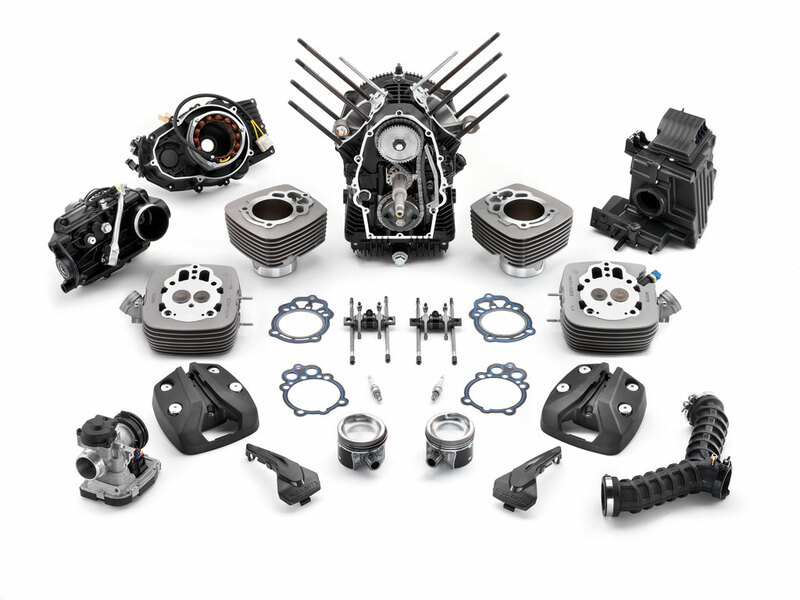 Moto Guzzi says the engine is made of 70% new components with over 200 individual parts getting redesigned. 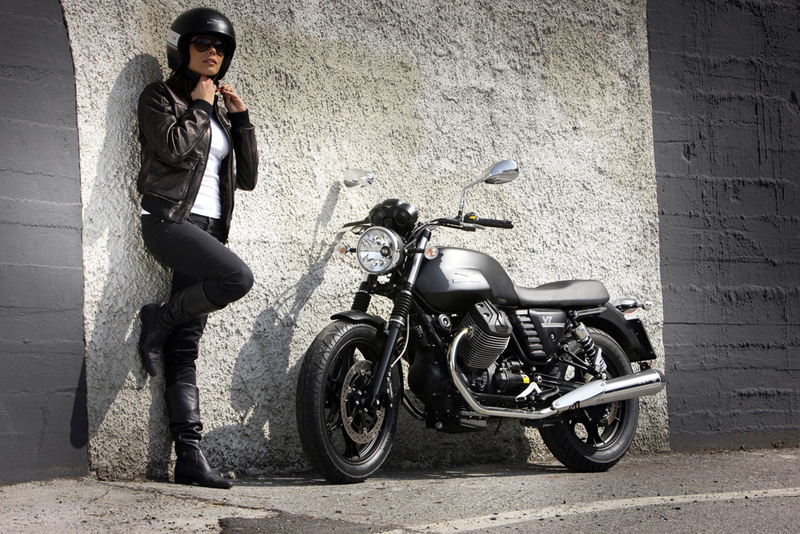 Moto Guzzi claims an output of 50hp at 6200 rpm with a peak torque of 44 ft-lb. 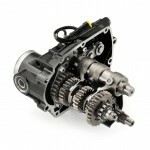 at just 2800 rpm. All three models are equipped with 40mm telescopic forks, preload-adjustable twin rear shocks and four-piston Brembo front wheel calipers. 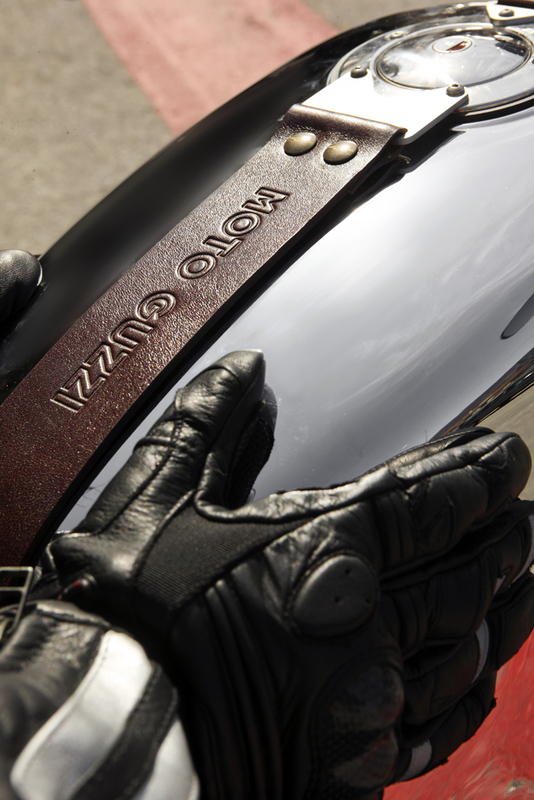 Each model has a 5.8 gallon gas tank (including a gallon of reserve) and have a claimed curb weight of 395 pounds. 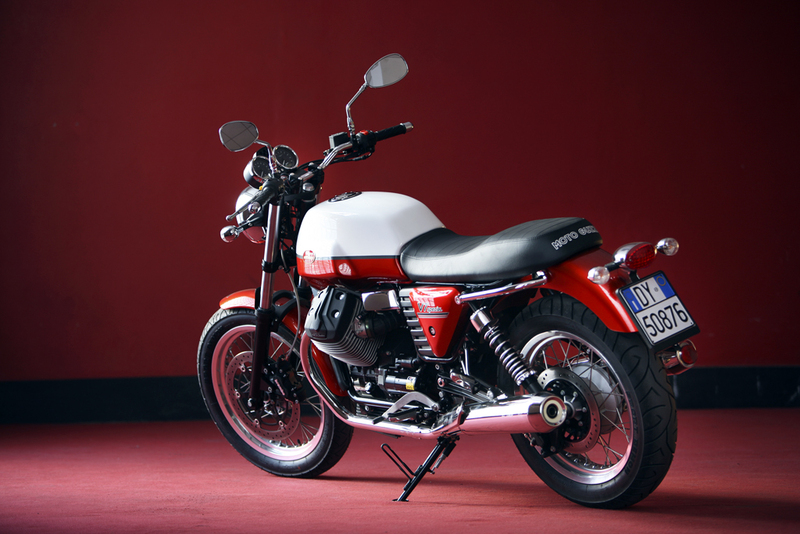 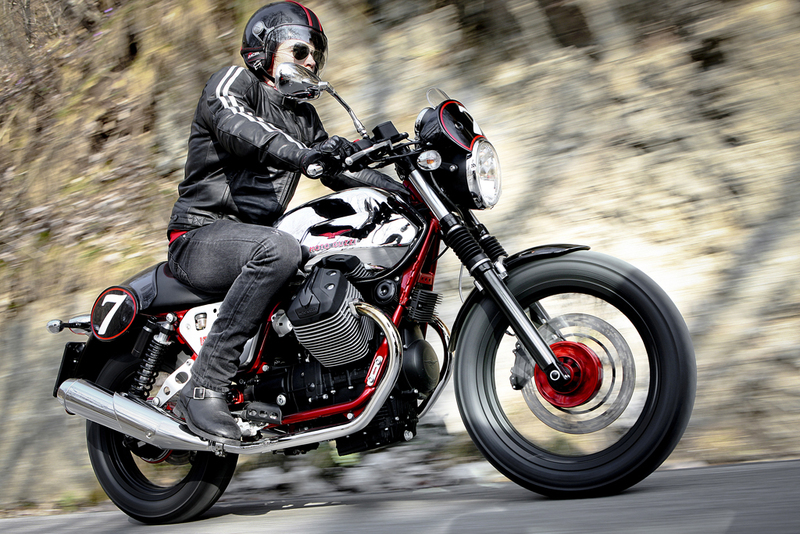 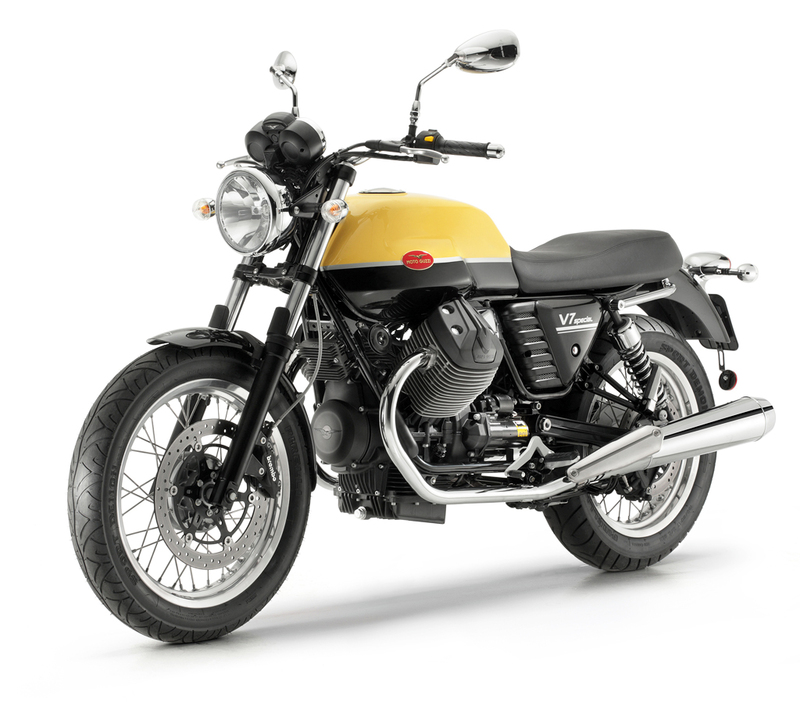 Moto Guzzi is calling the V7 Stone its entry-level model. 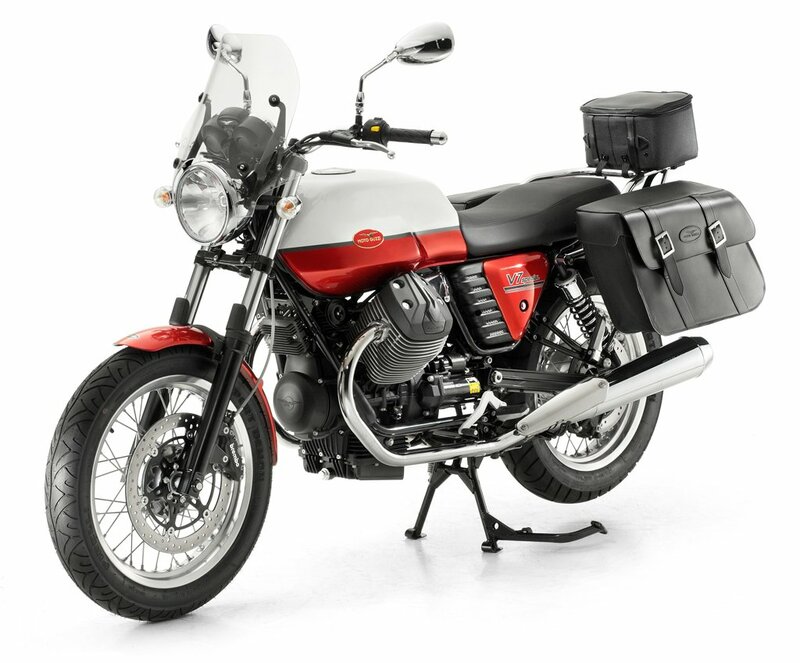 The V7 Stone uses alloy wheels with six split spokes and are said to weigh less than the rims on the 2011 Moto Guzzi V7 Classic. 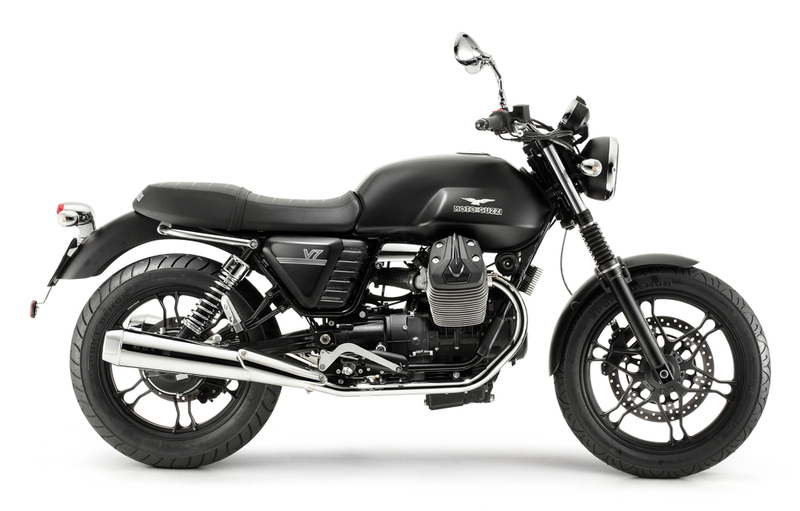 Moto Guzzi says the front wheel is 1440 grams lighter while the rear wheel is 860 grams lighter, combining for an overall 30% reduction of gyroscopic inertia. 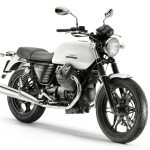 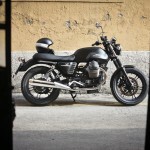 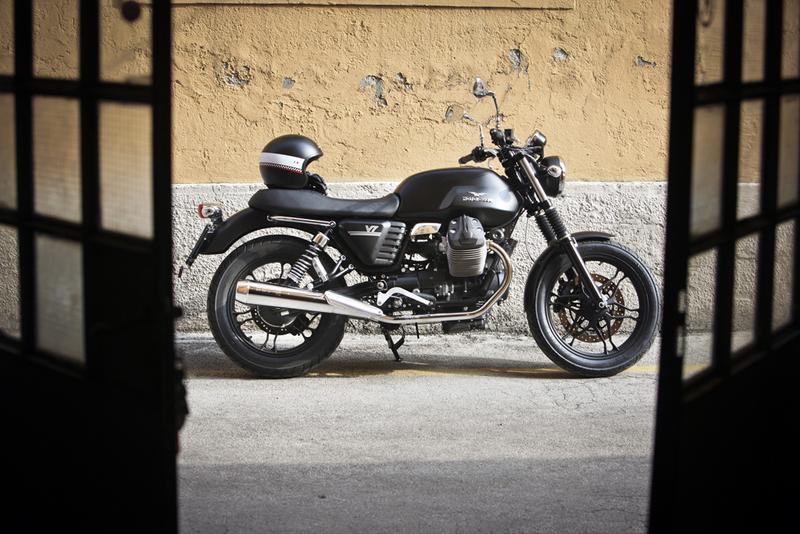 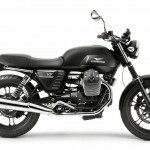 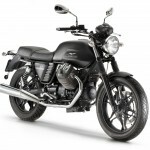 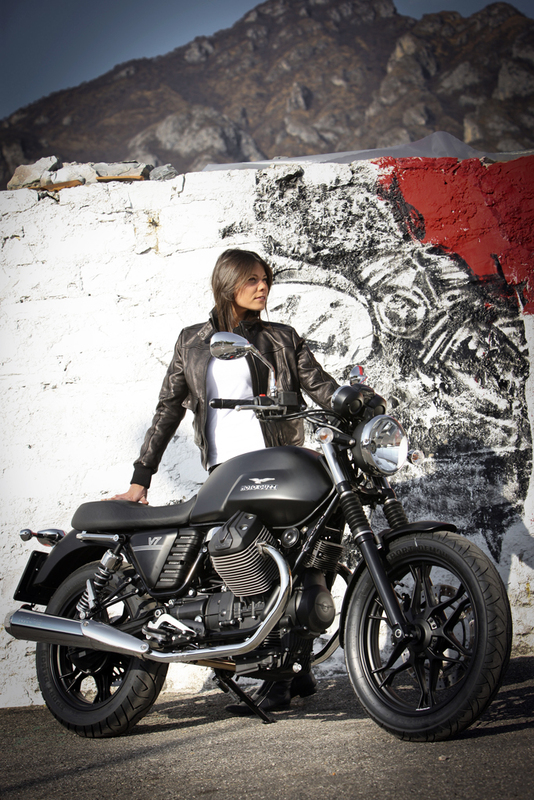 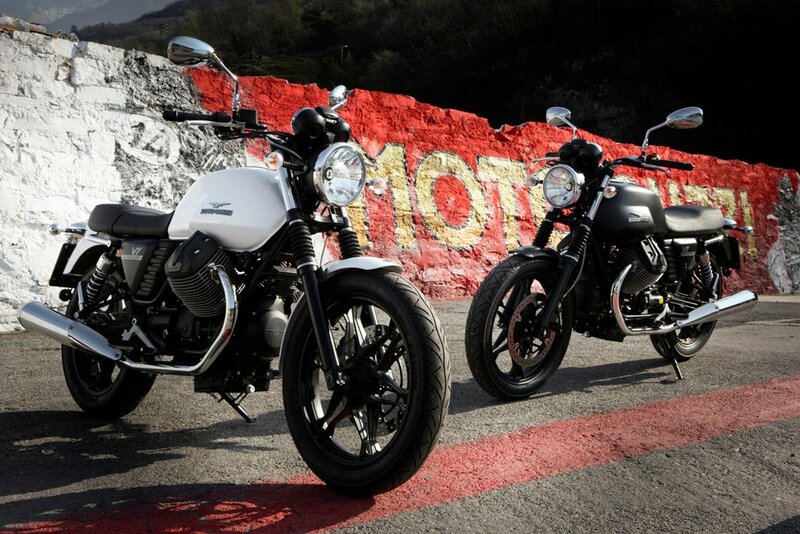 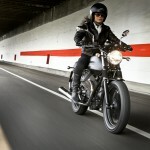 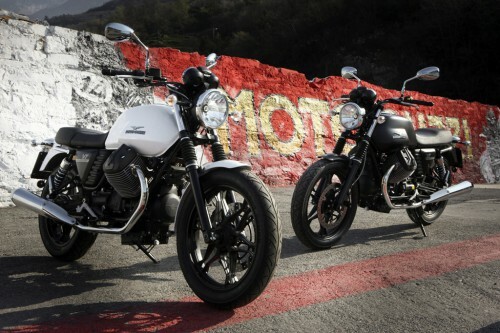 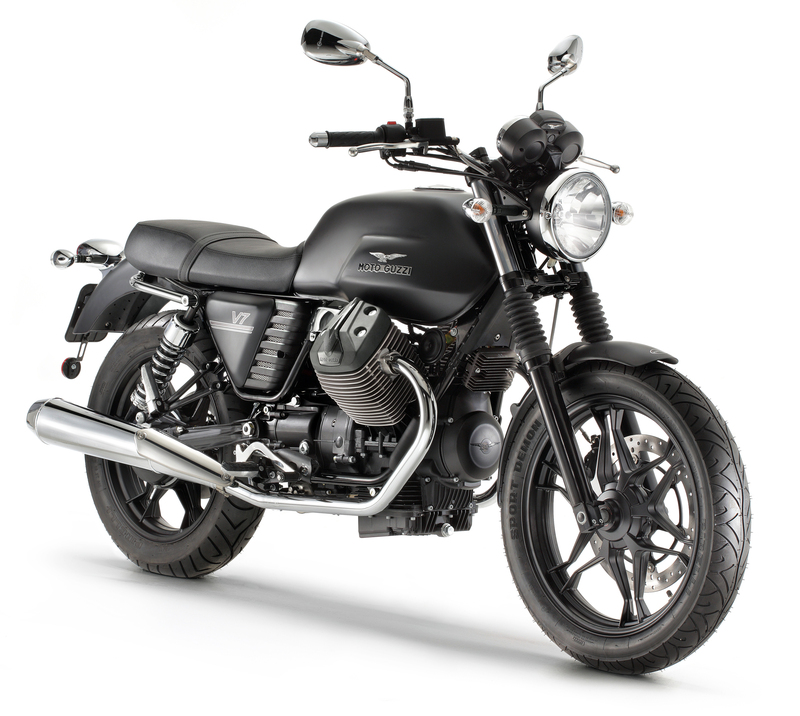 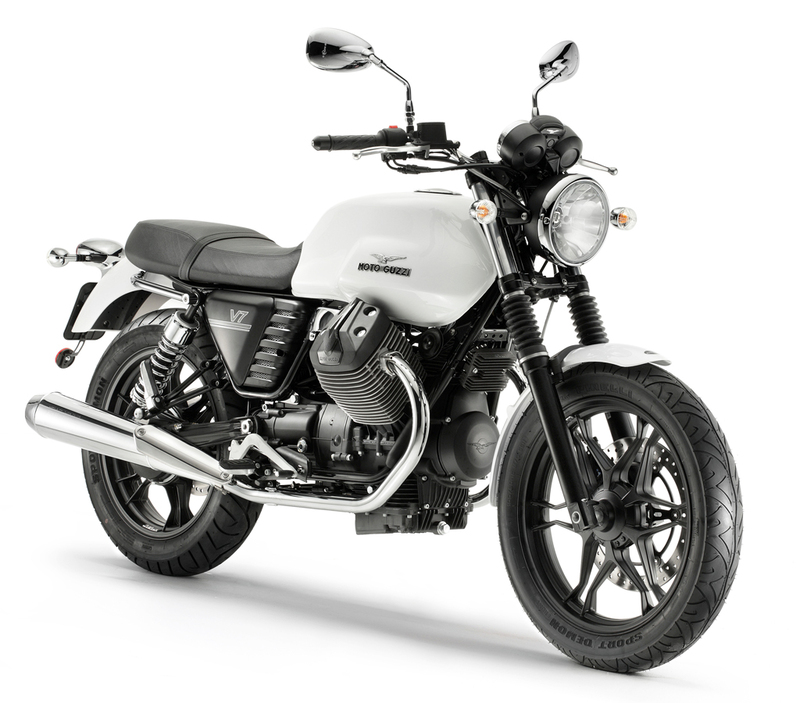 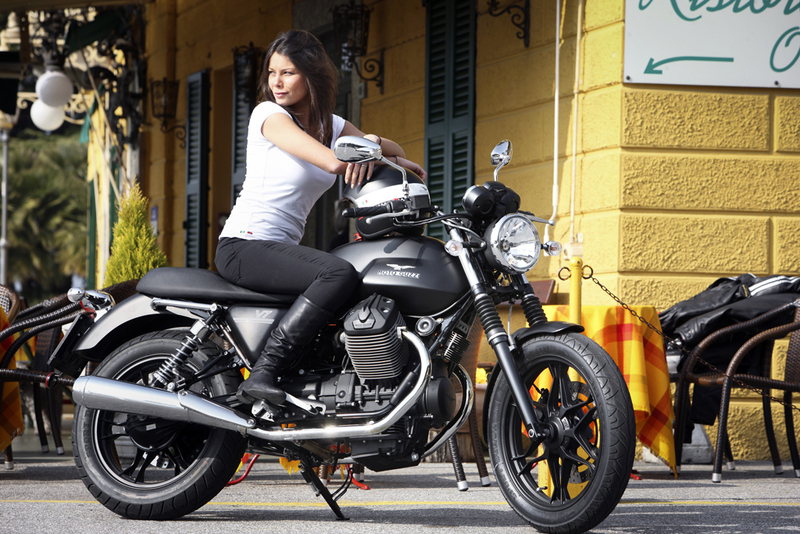 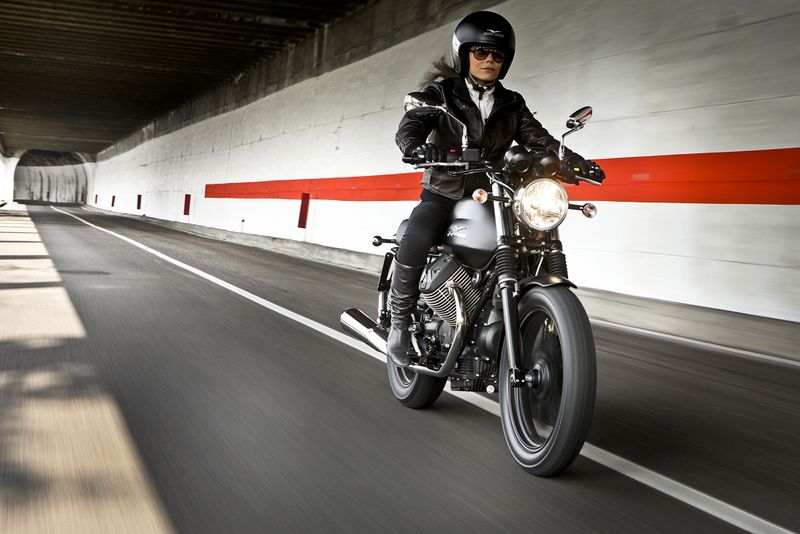 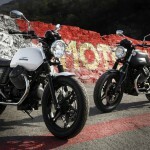 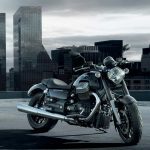 The Moto Guzzi V7 Stone will be offered in matte black or matte white. 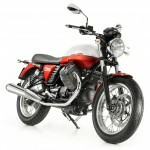 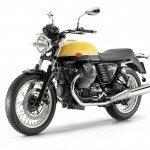 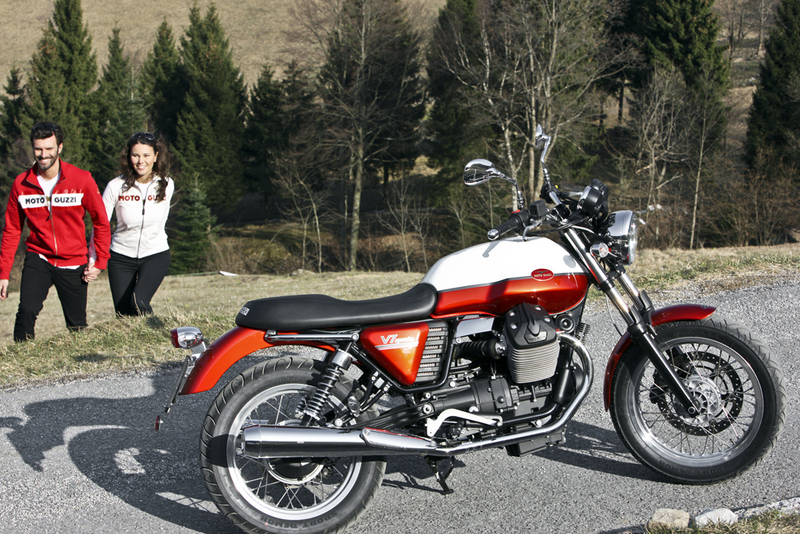 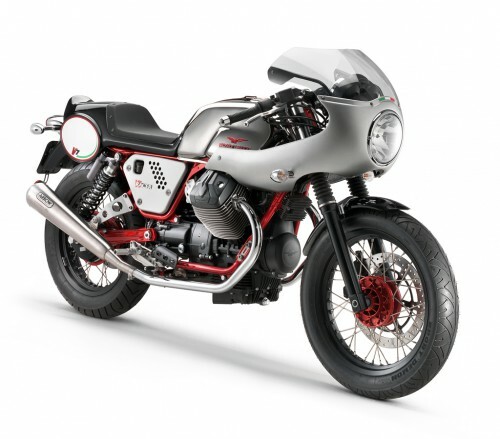 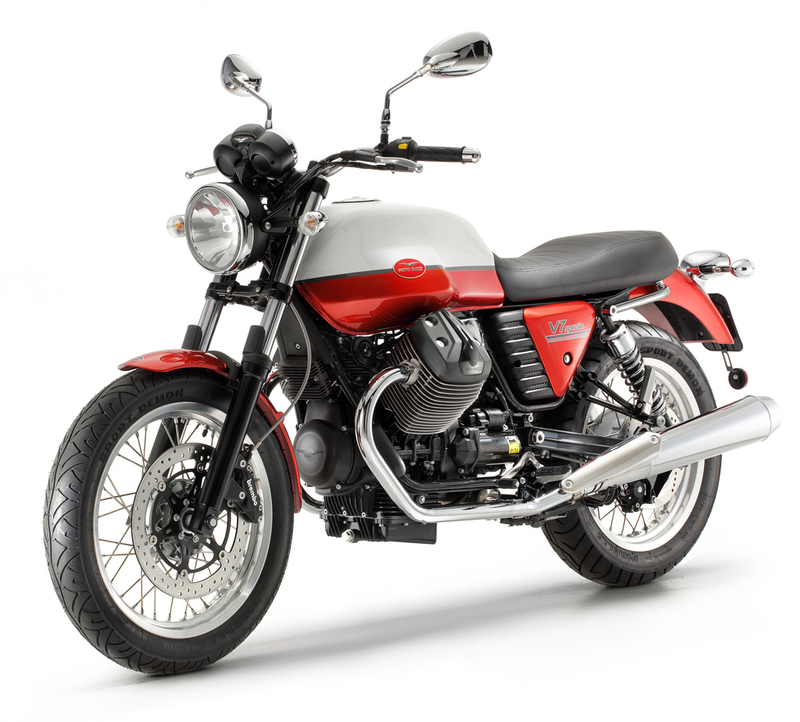 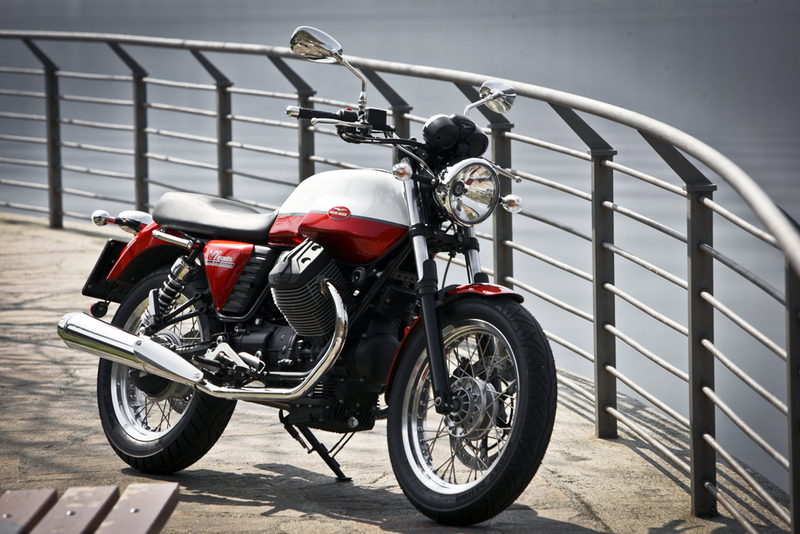 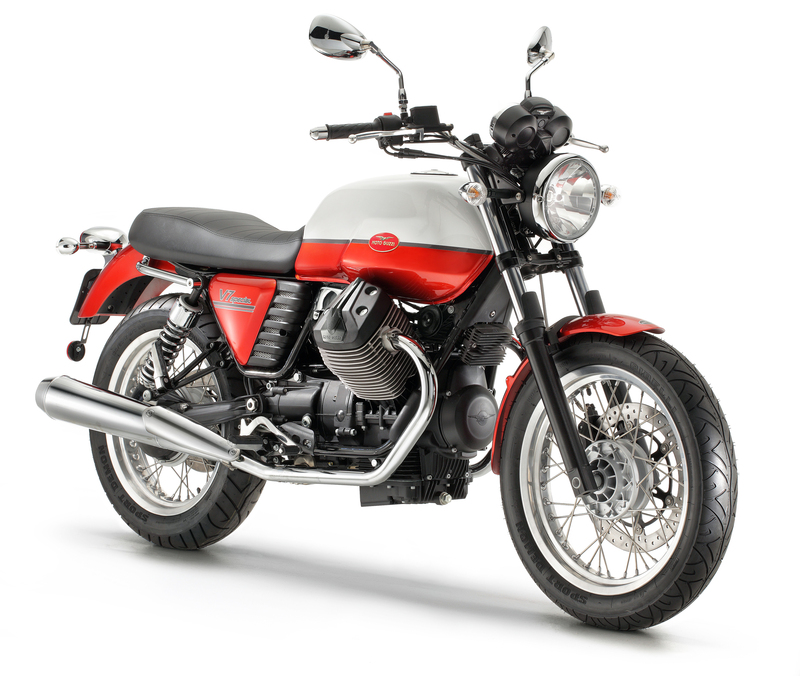 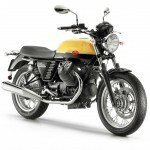 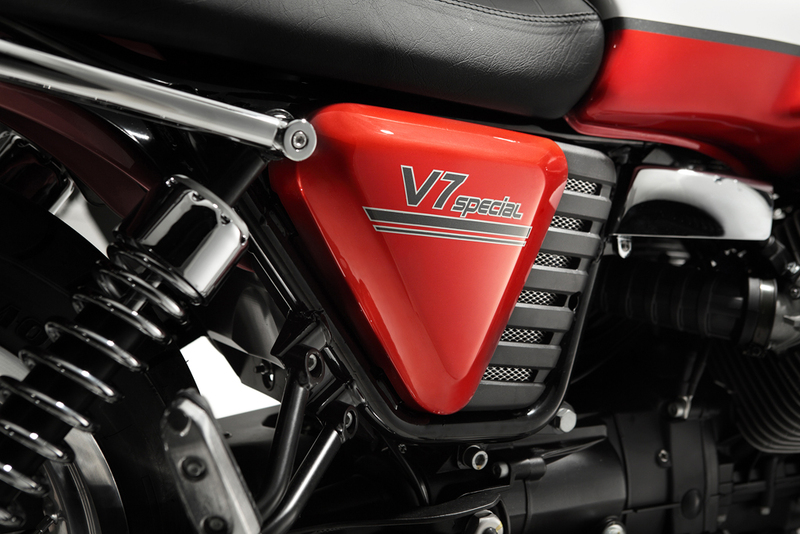 The two-toned V7 Special is so named because it was designed to resemble the original 1967 Moto Guzzi V7 700 model. 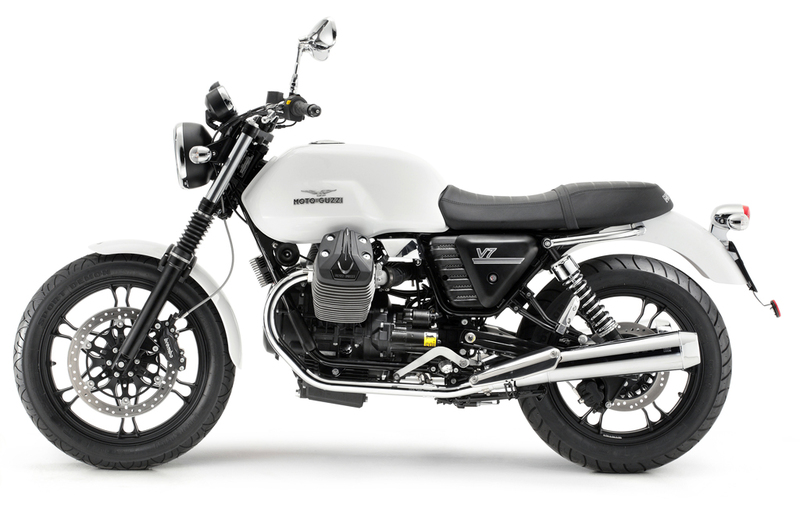 Instead of the Stone’s alloy spoked wheels, the Special uses aluminum wire spoke wheels, though Moto Guzzi says they are also lighter than the wheels on the 2011 V7 Classic. 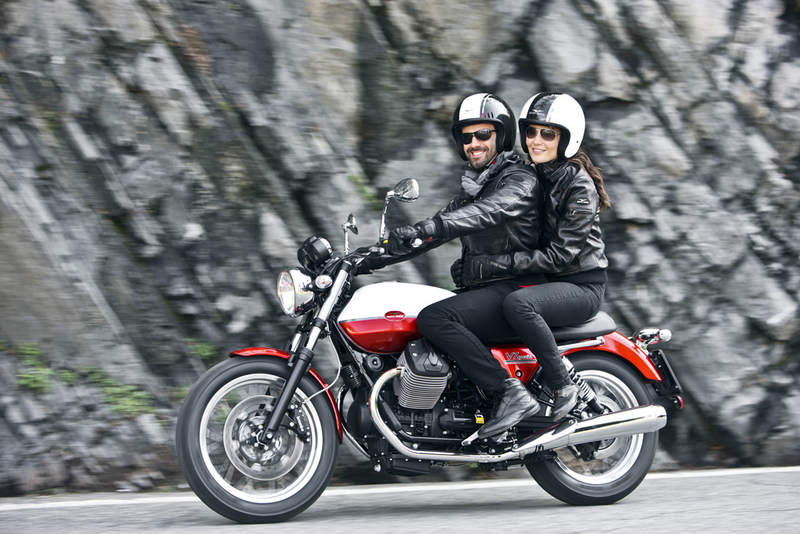 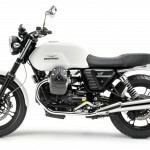 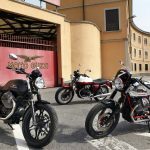 Moto Guzzi is positioning the V7 Special as the touring version, offering accessories such as a tail rack, center stand, windshield and panniers. 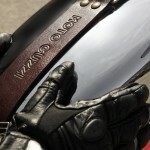 Truthfully, however, those same accessories are available for the V7 Stone as well. 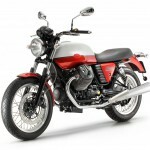 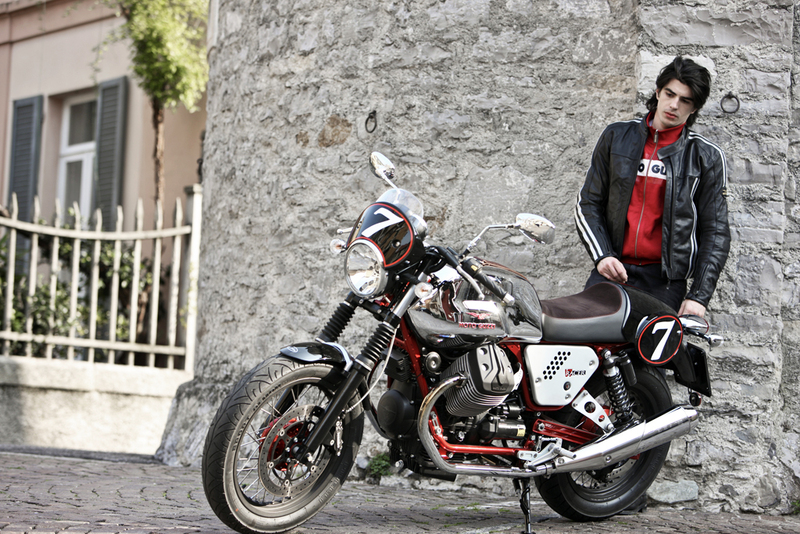 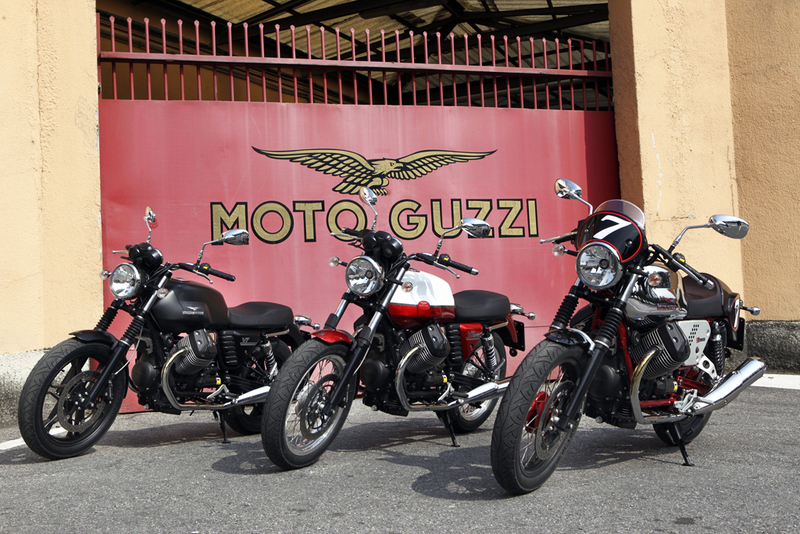 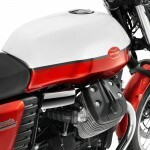 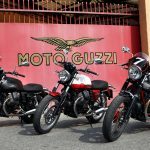 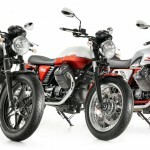 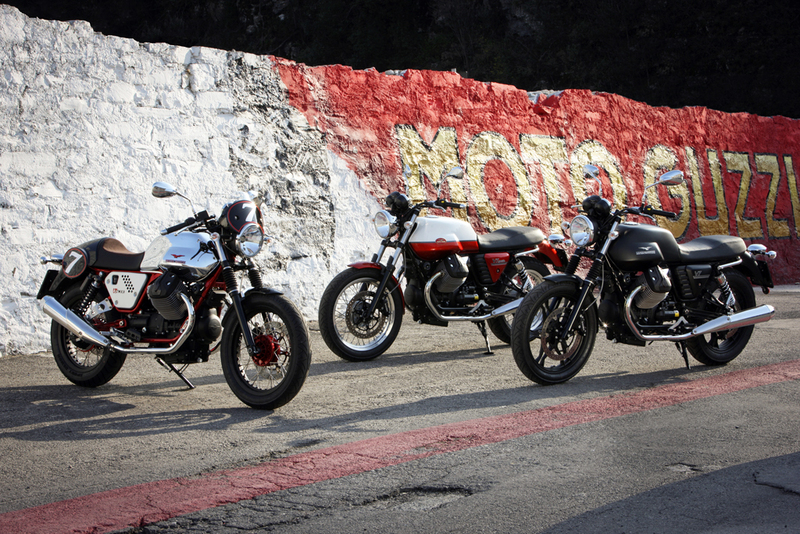 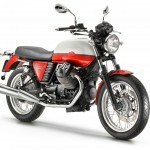 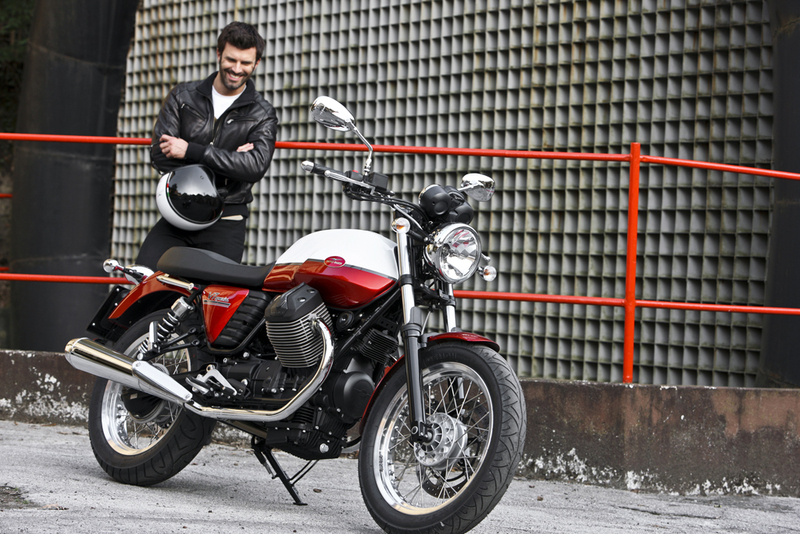 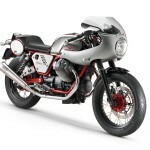 The Moto Guzzi V7 Special will be available in red and white or gold and black. 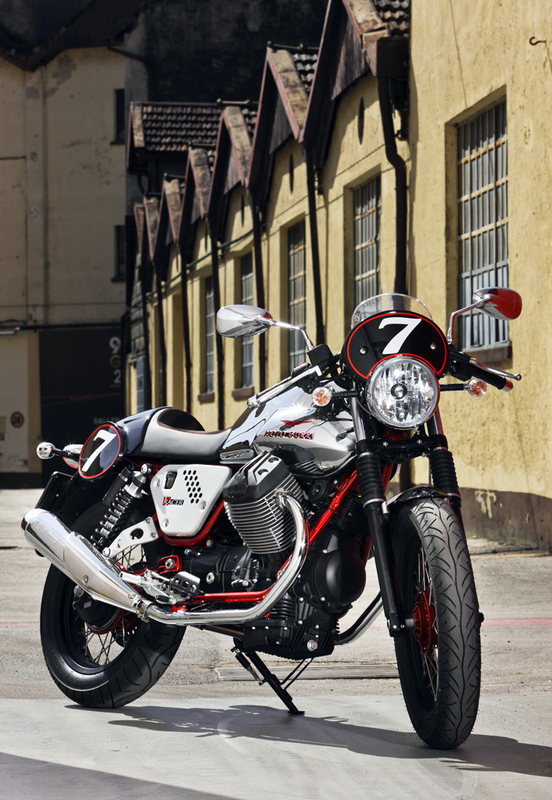 Previously offered as a limited edition model, the V7 Racer returns with a few updates, and will again be available in limited, serial production. 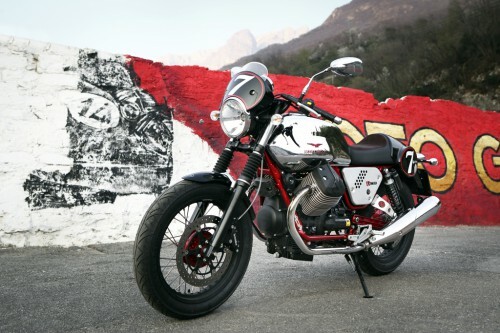 Design highlights include the red frame and brake calipers and the chrome fuel tank (North American versions of the 2011 Moto Guzzi V7 Racer had a black tank instead of chrome; we’ll have to wait to see if the same applies to the 2012 version), and the leather strap that runds along the tank. 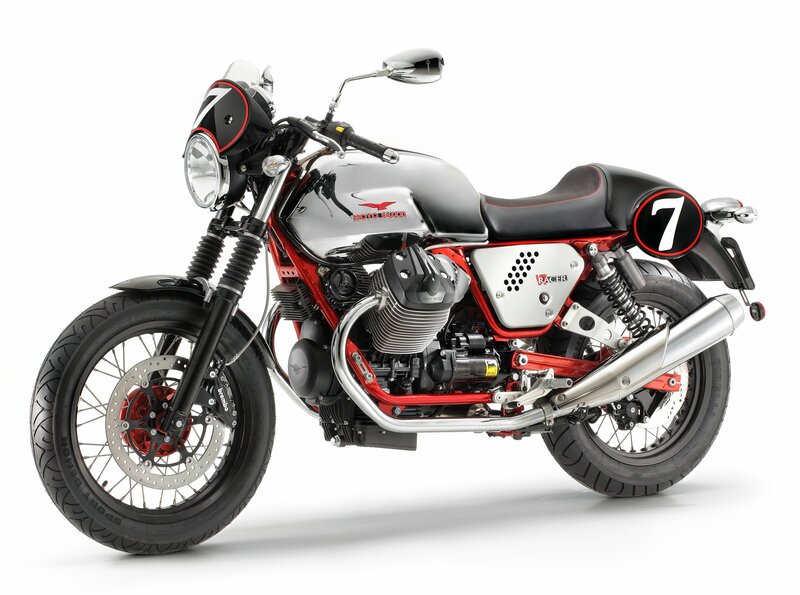 Unlike its two siblings, the Moto Guzzi V7 Racer comes with number plates, fork gaiters, a single seat saddle and a small windscreen. The Stone and the Special come with preload-adjustable rear shocks but the V7 Racer is equipped with fully adjustable Bitubo shocks. 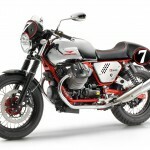 The Moto Guzzi is also providing a host of accessories for the V7 Racer. 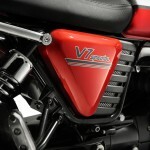 Perhaps the most eye-catching is the fairing which is part of the V7 Record Kit. 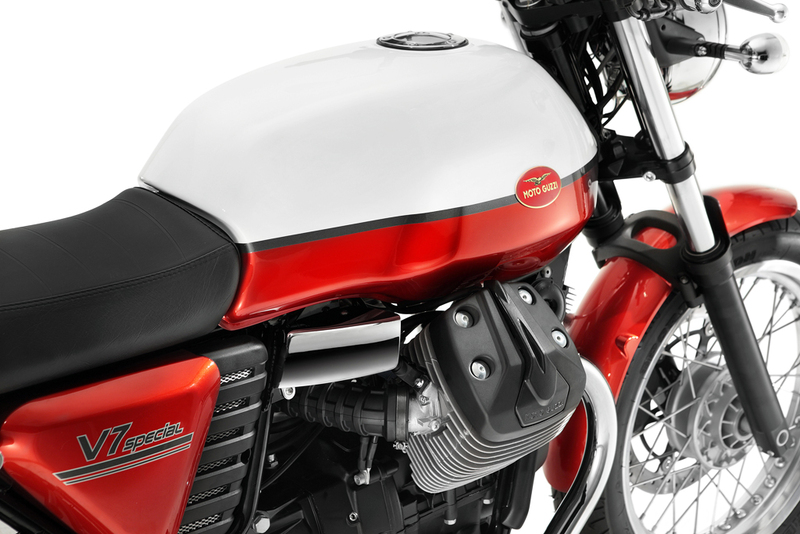 The kit also includes a seat with a spoiler end. 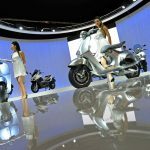 No word yet on U.S. availability but judging by Piaggio’s usual pattern, we should expect to see them here in the fall as 2013 models.